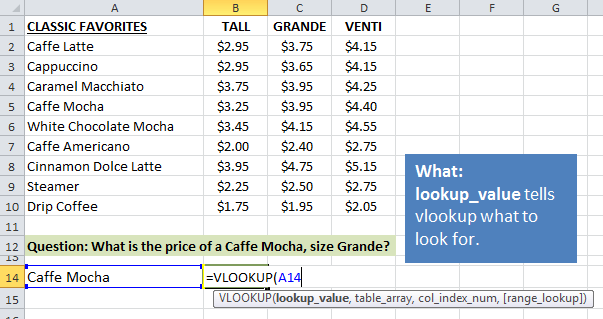 This post explains the Vlookup function in simple terms using a Starbucks menu as an example. Includes a step-by-step guide on creating a vlookup formula and free file download to follow along. 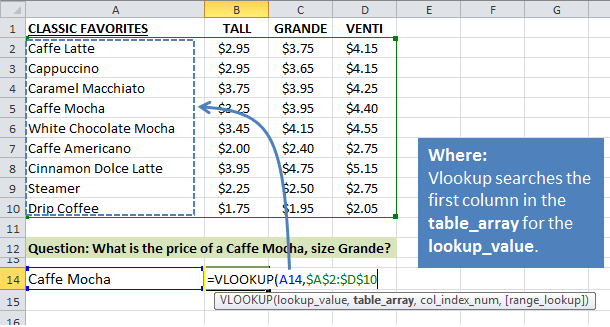 Bottom Line: Learn how the VLOOKUP function works with this simple explanation and example using a Starbucks menu. You can download an example file below to follow along. In this article you will learn the basic concepts of the VLOOKUP function. 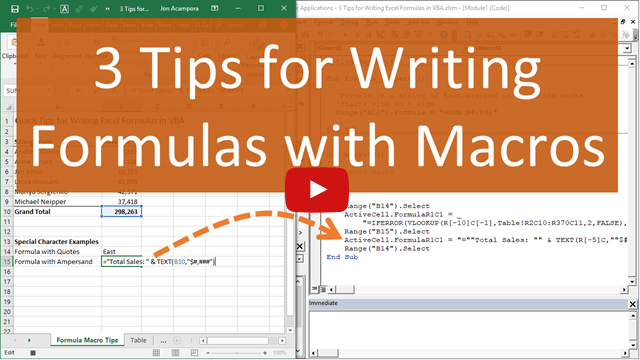 I provide a step-by-step guide on how to write a vlookup formula and you can download an Excel file to follow along. I was standing in line at Starbucks the other day, studying the prices on the menu, and I realized I was doing a bunch of vlookups in my head. As I scanned down the items on the menu and then looked across to the price columns, I was doing the same thing a vlookup function does. So I thought this might be a good way to explain the vlookup because everyone can relate to ordering from a food menu. And even if you're already a vlookup expert, this might help you explain the function to your co-workers. The job of the vlookup is to look for a value (either numbers or text) in a column. Once it finds a match, the vlookup will return a value from any cell in the same row as the match. First we look down the list of items on the left side of the menu until we find Caffe Mocha. Once we find the item, we then look across the columns to the right to find the price. The prices for the size Grande items are listed in the 3rd column of the menu, so we scan over to the 3rd column to find our price. There it is, $3.95 for a delicious cup of energy. Now we'll take a look at how this example works in Excel. I recreated the Starbucks menu in Excel for this example. You can download the file to follow along. We will use the vlookup function to answer this question in cell B14. 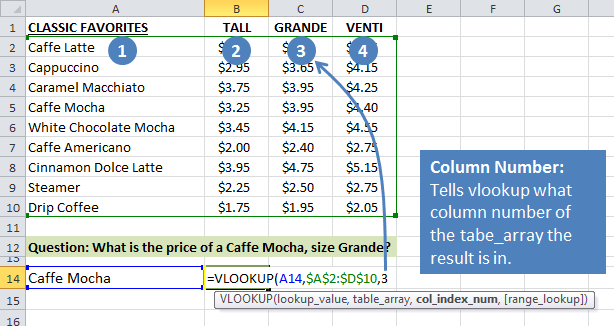 First we need to understand the components or arguments that make up the vlookup function. The following image shows the Excel definition of the Vlookup function, and then my simple definition. This simple definition just makes it easier for me to remember the four arguments. 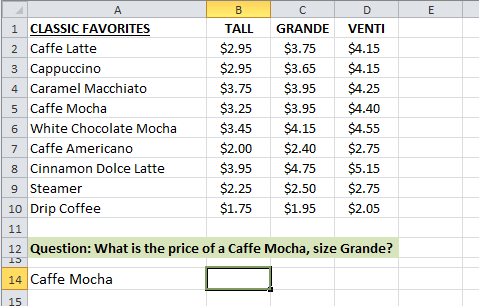 Now we will create the vlookup formula to find the price of the Grande Caffe Mocha. In the first argument we tell the vlookup what we are looking for. In this example we are looking for “Caffe Mocha”. I have entered the text “Caffe Mocha” in cell A14, so we can make a reference to cell A14 in the formula. We could also add the text “Caffe Mocha” (surrounded in quotes) directly into the formula. But using cell references (A14) makes the formula easier to copy down and reuse for lookups on other items. 2. table_array – This is the where argument. We need to tell the vlookup where to look for “Caffe Mocha”. This argument is specified as a range of cells, and the vlookup will only look in the left column of this range. We also need to include the columns that we want to return a value from. In this case we need to include the price columns because we want to return the price for our lookup_value. So I reference the range $A$2:$D$10 in the second argument of the function. This means that the vlookup will look through all the rows in column A, from A2 to A10, in search of the value “Caffe Mocha”. Once a match is found it will then look to the right a specific number of columns to return a result. 3. col_index_num – This is the column number argument. The column number tells the vlookup which column in the table_array we want to return as the result. It counts the columns from left-to-right based on the starting column of the table_array. Since we want to know the price for the size Grande, I put the number “3” as the third argument of the function. This will return a result from the third column (column C) of the table_array. 4. [range_lookup] – This is the closest match argument. Here we specify whether the vlookup should find an exact match or closest match to the lookup_value. By default, the vlookup will find the closest match to our lookup_value and return a result. This method is best used for looking up numbers. However, for our example we want to find the exact match to the word “Caffe Mocha”, so I will put “False” for the range_lookup argument. This means that the vlookup will look for an exact match to the value “Caffe Mocha” in the first column of the table_array. If it does not find the word it will return an error (#N/A). The Result – $3.95 for a Grande Caffe Mocha! The vlookup formula returns the value 3.95 in cell B14 as expected. 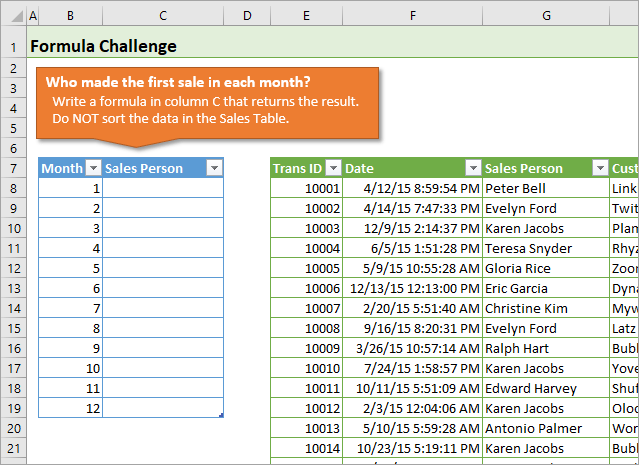 This formula can now be reused in other cells to look up other items in the menu. Or you could change the value in cell A14 to a different menu item, “Cappuccino” for example, to instantly see the price for the size Grande Cappuccino. Conclusion – It's Time for a Coffee! I hope this helps you understand the basics of how the vlookup function works. Vlookup is one of the most commonly used functions in Excel for looking up data, and it's a great one to know. This article only scratches the surface of what can be done with the vlookup function, but it's best to understand the basics before you learn more advanced techniques. As always, leave a comment below with any questions or suggestions. This article is part of a series on lookup functions. Please checkout the other articles below. Hi Jon,I was unable to use the $ sign with my table array using F4 on my keyboard. I am using a laptop. Could you please tell me how else I could anchor my table array? Thank you for the refresher course, if you don’t use it you lose it and it’s always helpful to see a great version of instructions. Can you please me to calculate salary using Vlookup? I’m very grateful to you for helping me understand Vlookup function, as it is something i have struggled to understand.I can now go to my office and assist my colleagues. this blog is very useful and easy to understand. Hello John, thank you very much for the excel tutorials. I greatly appreciate. The tutorials are really helping me very much. What if in the main column to look up, there were 2 café mochas listed? This won’t happen with text, but what if there were numbers in that column, say two 17s? Does it default to the first one? Should you only use lookup if each item in the lookup column is distinct? Thanks for this explanation Jon. For some reason, I can’t help to think that for each example I read I could simply search in excel for the lookup value (in the left column like Cafe Mocha) and simply look to the right in one of the columns. I know that is a very trivial and simple way to complete the above situation but in reality, it would have the same result fairly quickly. Can you help give an example that debunks this use case? There are many situations in which that would not work. Let’s say you have 2000 rows of data and you want to transfer a certain value from one worksheet to another. This is a new set of data, and there’s a specific value you need to copy over from the old data to the new. Instead of writing in the values manually one by one, you can use a VLOOKUP function to find the value you’re looking for and automatically populate the sheet with one formula. The explanation of the Vlookup application is great! Very helpful! Hi Jon, great tutorial. Do you have a link to questions/answers for vlookup questions using different data-set scenarios? Hello everyone reading this, the one thing I noticed that you missed or skipped over Jon was that you can also use this over multiple sheets by adding ‘Sheet Name’! intothe formula after the first comma before Where Cell Numbers. Thank you Blake! Yes, this was just an introduction to VLOOKUP. We can use it to return values from other sheets or other workbooks. 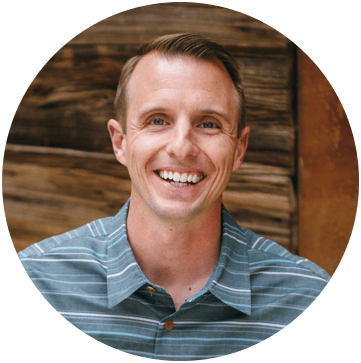 Jon – You’re a hero – I have struggled for years understanding how to do VLOOKUPs when I need them (about every 18 months). You’ve made the inscrutable, ‘scrutable’. My formula is not running. It has all the values correct. When I click enter, nothing happens. May I ask is the What you have there the same as the destination? I.e. you are asking for a value in the same place as where you want the number displayed? Hopefully that should fix the issue if not then I am also stumped. Thank you for the detailed explanation Blake! Avi, as Blake mentioned, the Col_Index_Num argument needs to be changed to a 1. Since there is only one column references in the Table_Array (column D), then this formula will lookup the value in column D and return the value from the same column. If you just want to check if a value exists in a column, we can use the COUNTIF function instead of VLOOKUP. your easy approach helps me to understand the concepts clearly and encourages me to learn more to become an excel expert. your easy approach helps me to understand the concepts clearly and encourages me to learn more to become an excel expert. thanks a lot. keep it up. I am unable to understand what “closest match” means. For example why would we look for closest match in case of Caffe Mocha when we have the exact match. I am not limiting my query to Caffe Mocha only. After all there is a corresponding cell in the same row which is filled, then why closest match. Checkout my article on VLOOKUP with Closest Match for an explanation on this. Thanks! Thanks for help. It is helpful learning.